Colorado FriendShip was born as an emergency relief organization dedicated to delivering emergency food and clothing to disaster victims. In the past 18 years, our mobile units have fed and clothed victims of the Jamestown, Fourmile Canyon and High Park fires, the Holly and Windsor tornadoes, and the 2013 Colorado Flood. We even travelled with a truckload of supplies to Shreveport for victims of Hurricane Katrina. Though still available to supply disaster relief, Colorado FriendShip now focuses on the daily needs of our community's less fortunate. 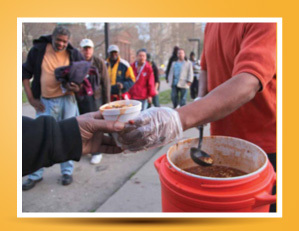 On any given day, you'll find our volunteers feeding underprivileged kids through our weekend food program, and delivering hot meals, nutritious groceries and clothing to poor families, the jobless and the homeless.